Sensex 17000-17300 Nifty 5120-5170 Very strong supports – Fear at a high. Selective Buying Advised. INDIA VIX made a top day before yesterday with the sudden spike down. 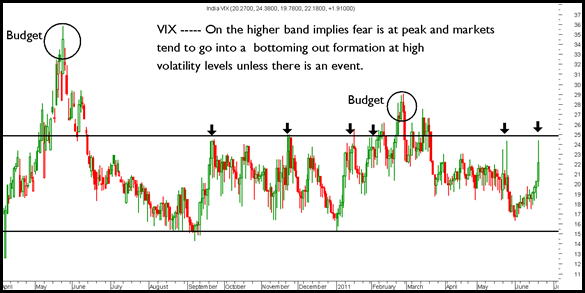 VIX tends to top at 25 levels and market bottoms out at such high vols. 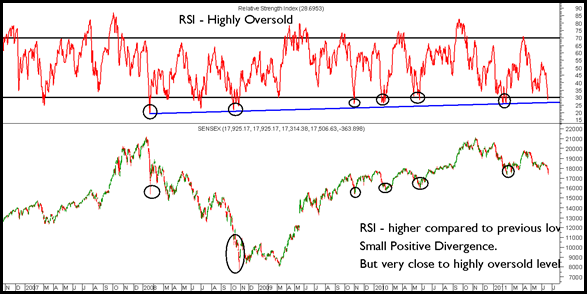 RSI is back to the lower end and has generally not gone much below current levels in normal scenario. Exception being Oct 08 and Jan 08 which were out of the blue scenarios. Midcap Picks – First Leasing , BOC India as defensive slow moving picks. July 1st week major fall. do you think that investments can be made at these levels for the long term? Please keep reading the blog for more inputs. We dont give free calls 🙂 as such but we do give our analysis on the blog.